Batman stalks the villains of Gotham and for many he is their worst nightmare. Bats may be inherently scary to some, but in nature they are not the top of the food chain and several animals like to eat them for a snack. One such animal is the Owl, a natural enemy of the Bat. This being Gotham dressing up as an Owl and harassing Batman is not beyond the realms of possibility, but with the Court of the Owls this is more than just a masked menace. For centuries a cabal of the richest Gotham denizens have secretly worked to control Gotham, is this their time to step from the shadows and make a grab for full control? When an Art History Professor is murdered it is just another sad day in Gotham, but even in a world of maniac clowns, crazed penguins and whatever Killer Croc is, a person spontaneously combusting is not normal. Batman investigates and soon realises that his old foe The Court of Owls have returned. Why would this hidden society threaten to expose itself by killing a seemingly innocent academic? Whatever their reason it has to be something powerful enough to threaten all of Gotham. 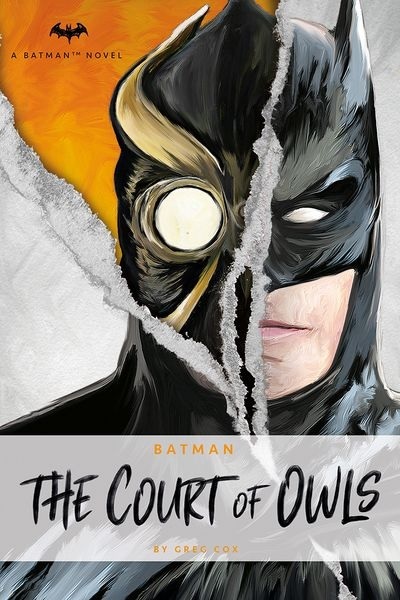 The Court of Owls by Greg Cox is an original Batman novel and is one of the most satisfying superhero tales I have read in recent years. Taking comic book characters onto the big screen has become natural, but as straight prose their existence is not as common. If Court is anything to go by they fit into text as well as they do any movie. Cox has chosen to set this outing in a modern feeling Gotham where Batman has the latest 2019 technology and the aid of both Nightwing and Batgirl. When facing the warrior arm of The Court of Owls, known as The Talons, he needs all the help he can get. Cox has interpreted the Batman mythos wonderfully by remembering what DC stood for originally. Batman is human under all of this technology and he uses his devices to aid in his investigation and not just for leaping over tall buildings. Court is an intriguing crime story wrapped up in Batman livery and by staying true to Batman’s Detective Comic roots, Cox has created a thrilling ride. After the Professor’s death, Batman has to aid two young academics who are the next targets for The Talons. Batman and his allies must use all their intelligence to find and hide the two students before they lose their heads (literally). Cox is able to develop the characters so that you care about the potential victims, Batman may be cold on the outside, but he will do anything to help innocents survive. The inner turmoil within Batman is heightened further by his past run in with the Court where they almost drove him insane. I have not read this previous outing about the Court, but Cox does a deft job of weaving in the history without alienating the reader. To flesh out the central mystery Cox chooses a split narrative as we jump between present day Gotham and that of the 1910-20s. Here there are some supernatural elements that sit a little uncomfortably within the Batman universe, but seeing as he is mates with Martian Manhunter you can’t really separate Batman from the wider world of DC. Another issue is the basic premise of a secret group allowing a member of their fold to be so open. A few homeless people dying is one thing, but the beheading of four police officers and the murder of two others is another. No matter how many cops you have paid off, you kill six of their own and they will come for you. You do have to suspend your disbelief when entering Gotham, but you question why anyone would live in that city when you read this book. The minor issues with this book are mere blips in what is otherwise an outstanding outing for The Bat. There is plenty of tension as the mystery unfolds as well as some great action set pieces. Cox was able to balance the cold nature of Batman’s façade with his inner turmoil without overplaying the hand. If other books based on comic book heroes can capture the action of the illustrated form, but add nuance as well as this, then count me in for more. Written on 5th February 2019 by Sam Tyler.